Carson Wentz has fought pain and time. He spent much of the past 14 months recovering from two injuries that halted his second and third NFL seasons. He watched Nick Foles lead the Eagles to the Super Bowl, then again lead them to the playoffs. This has tested Wentz in a way that he couldn’t have imagined when he first arrived in Philadelphia as the franchise’s savior, and it has challenged his exacting personality in a way that left him conflicted while his team achieved such success without him. 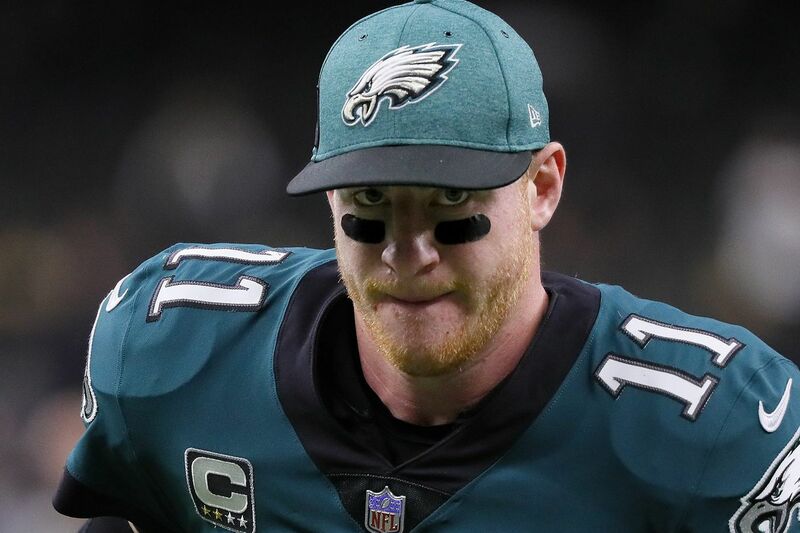 The Eagles are committed to Wentz as their franchise quarterback, but they need him to rebound after a year that challenged his health and mind. When asked if there was friction on the Eagles or if he encountered any of the sentiments that emerged in the story, he said no. Wentz denied that he was involved in a verbal altercation. He said he never objected to running any play because it was designed for Foles. And he rejected the notion that he “bullied” offensive coordinator Mike Groh. Carson Wentz said his relationship with offensive coordinator Mike Groh (right) was "great" and will only get better. At age 26, Wentz realizes he’s not going to take on the persona of a California surfer. His personality is comparable to those of other elite quarterbacks. It was described as driven in 2017 before it was painted as uncompromising in 2018. Carson Wentz said he and Nick Foles aren't very similar. "But that’s why I think we were such good friends to some extent as well," he said. Wentz said that the unique nature of the past year affected how he might have acted in the locker room. After he tore his left ACL in December 2017, Wentz said his entire focus was on returning to full health. Throughout the offseason, Wentz needed to work out on separate fields while his teammate practiced. Carson Wentz rubs his knee during the Dec. 10 game against the Rams that ended his 2017 season. Wentz would not pinpoint why it happened that way. He said there are plays throughout the season that affect each game, and it culminates in the overall record. The average margin of defeat in five of the six games the Eagles lost with Wentz at quarterback was 4.4 points. The average margin of victory in four of the five games the Eagles won without Wentz was four points. The games swung on a series of play – a key conversion, a made kick, a missed kick. It’s simple to look at the quarterbacks in those games and draw a conclusion, but there were other factors at play, too. While the Eagles went on their late-season run, coach Doug Pederson emphasized that Wentz needed to focus on his health. Wentz said his back is “getting better” but he cannot rush the recovery because it’s a fracture. He must let the healing take place. He’s hopeful that he will participate in football activities this spring.